KENSINGTON GARDENS, LONDON It was a beautiful day once again for the preview of the Serpentine Pavilion, this year designed by Chilean architect Smiljan Radic. And the pavilion itself once again a real surprise, completely different from any previous ones. 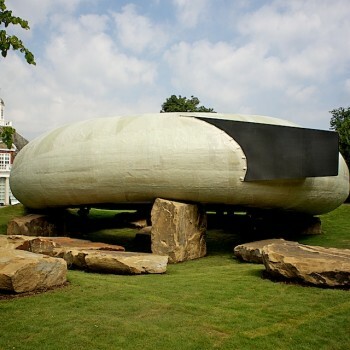 It’s a fusion of ideas, where Radic’s obsession about forms in nature is expressed in a sturdy composition of a donut shaped space sitting on heavy rocks. The way he has combined a thin fibreglass material against the stone looks futuristic and pre-historic at the same time. For the relatively unknown Radic it was a challenge to create something for the central London site, which is so charged with history. Radic has a calm, bear-like presence, and he works with a very small team in Chile. “The commission in this symbolic space was a problem first”, Radic said ” I don’t think so fast, and to come up with something in just two months is a short time”. He describes the outcome as “crude architecture”, assembled “a little bit like papier-mâché” aiming for “a handmade look, which is really difficult to do in this scale”. The pavilion is more like a piece of sculpture and shows the 1960s architectural sensibilities that Radic draws ideas from: “Cedric Price, Superstudio and Archigram”. He created several models before deciding on the final form “I created maybe five models, it’s not a linear process” he described the design stage before he found the right form.